Completely Restored Bungalow in Historic Kenwood with Large Front Porch and Open Floor Plan! This Two (2) Bedroom, One (1) Bathroom, One (1) Car Detached Garage Single Family Home with Inside Laundry Room has been Renovated from Top to Bottom, Boasting a Brand New Kitchen with Quartz Countertops and Stainless Steel Appliances, a New Bathroom with Marble Floors and Brand New Windows and Doors. The Home Feels Like New Construction with All New Electrical Wiring, All New Plumbing (Supply Lines and Sewer Lines), All New Air Conditioning System with New Duct Work and All New Plank Flooring Throughout. In Addition, the Owners of this Property have Installed a New Irrigation System with Well and Pump, all New Landscaping to Compliment Mature Oak Trees, a Fully Fenced Yard with Overflow Boat and Car Parking, and All New Pavered Front Walkway and Rear Patio. You Will Love the Natural Light that Pours Into this Home, as well as the Ample Closet Storage Space. Fresh Paint Inside and Out, in Addition to all New Trim Carpentry. 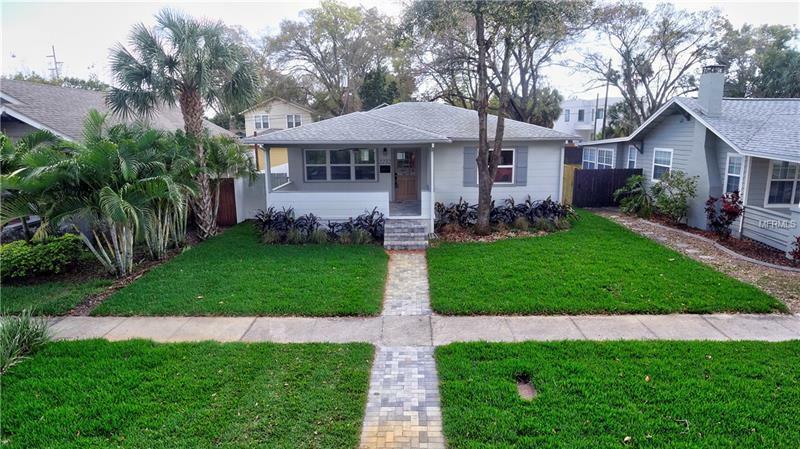 Located Just a Few Blocks to Central Ave and only a Few Minutes to Booming Downtown St. Petersburg. Don't Delay, This One Won't Last Long! Copyright © 2019 Mid Florida MLS. All rights reserved. The data relating to real estate for sale on this web site comes in part from the Internet Data Exchange Program of Mid Florida MLS. Information provided is for consumer's personal, non-commercial use and may not be used for any purpose other than to identify prospective properties consumers may be interested in purchasing. Pinellas Commercial Properties participates in the MFRMLS Internet Data Exchange (IDX) program, allowing display of other MFRMLS broker's listings on this site. However may not include all listings currently available. Information is deemed reliable but not guaranteed. Information last updated at 2019-04-23 05:38:24.